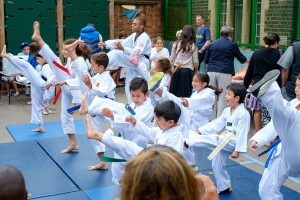 We train every Tuesday at St Joseph Primary School, Cadogan Street, SW3 2QT. Taekwondo training is in ground floor hall of the main building. Please call if you have any difficulties in finding us – or getting in! The closest underground stations to St Joseph School are South Kensington on the Piccadilly, Circle and District lines and Sloane Square on the Circle and District lines. Copyright 2013 © LLTKD. All rights reserved.